With the holiday season knocking round the corner, it will be a busy time for shoppers and as such online retailers. According to Google’s data from last year, more than 48% of online shoppers starts their holiday shopping long before black Friday. During survey, over 48% online shoppers said, they complete their online shopping on or before cyber Monday. Retailers, all across the globe will be fighting hard to make their catalogues stand out and attract the maximum amount of traffic to increase holiday sales. Looking back at the shopping behavior and the changing trends during the past one year, here are some tips that will help retailers maximize their holiday sales and make good use of the eager demographics. Checking data since a last couple of seasons, the traffic on ecommerce websites have double on a yearly basis. More and more consumers are looking to place their orders online than visit real time stores. The traffic for all combined ecommerce site started increasing from the month of July. This year, we can confidently say that not only are the modern consumers shifting towards online marketplaces but they are also earlier to book their orders as compare to previous year. As per recent research published by Think With Google, over 78% shoppers used internet to research about product last year. It is thus advisable to place your marketing goals early and try to push them through to the potential crowd. You should not forget to test your holiday readiness to avoid real-time crashes. If you are an online retailer and operating your business since long, you must have data for previous period. Start gathering those data and compare different metric to drive some conclusion. You can also study your competitors to understand the increased demand and can accordingly stock the products. As demand increases, you will have added opportunity to capture this open market by adapting different marketing channels. Google adword express is the best solution for small businesses who want to expand their reach to capture open market to increase online sales this holiday season. Now, big shopping days are divided in to smaller span upon increased use of smartphone purchase. According to Google, around half of the shoppers (48%) complete their shopping before holiday dates. Rather than focusing on only specific holidays dates, you should study your website traffic and user behaviors and can start promoting your products in advance. Holiday season is considered as the most competitive shopping season for retailers. You need to play smart to stay in competition by keeping your eye on competitor’s pricing and offers. Marketing and promotions has been a key driver to getting over the increasing competition in online marketplaces. Source: Google Data, Indexed Search Query Volume, United States. Over 92% of shoppers will check and compare the price of same product on online sellers to get lowest possible price. Over 91% shoppers say that the lowest price is the most important factor they consider while buying any products online and FREE shipping is second most important factors. Apart from these, there are numbers of factors that affect shopper’s buying decisions. Experts advise online retailers to make maximum use of Google shopping campaign this year and add to the credibility of their business by registering as a Google Trusted Store. Elements such as product reviews and ratings, Google product shopping campaign and competitive pricing analysis can give added advantages. Keep monitoring the pricing strategies of your competitors and accordingly increase or reduce the price of your products. It will help you to reduce the abandoned shopping cart rate on your eCommerce website. DigiFloor has recently published a detailed article explaining the importance of competitive pricing analysis. The modern customer always looks for convenience and mobile presents a great platform for the same. Globally, the statics portray that Google Shopping has sent three times more traffic every year. As such, retailers this year should make sure that mobile shopping gain prominence in their marketing strategies. More than half (53%) of shoppers used smartphone or tablets for holiday shopping last year which is up from 41% as compare to previous year. You will be surprised to know that nearly $1 trillion (28%) of all retail sales were influenced by shopping related mobile searches. To acquire mobile users, it is very important for you to have mobile browser compatible website. If your website is still not support mobile browsers, checkout our creative services to get your responsive design. Once you are ready with mobile browser compatible website, start promoting your products by targeting mobile audience too. Google adwords provides flexibility to target specific audiences based on their interest and search habits. You can also launch mobile application for your business to offer additional facilities to your customers. 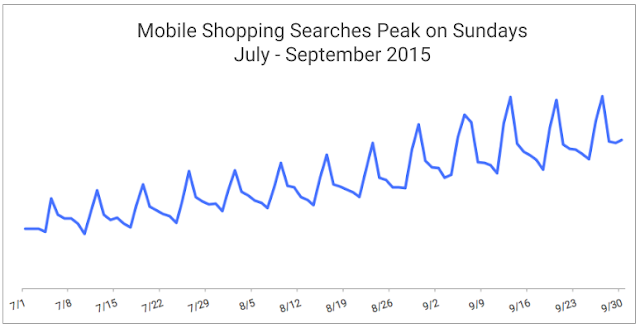 As per recent study published by Google; on an average mobile shopping is 18% highers on Sunday. This study will help you to increase or decrease your mobile paid marketing budget during weekend to acquire this customers. Checkout below image depict this behavior of mobile shoppers. Consumer engagement is also a key element to achieve success online. If you haven’t already, make sure you engage more with your customers, asking what they demand, finding every customer the right gifts, offering special services to loyal customers, and make sure that they come back to your site more than often. Test everything and be ready for the surge in traffic! Social media is considered as the best platform for customer engagement. If you are not active on social media, do it now. Building social media presence requires skill and time. Initially start with few platforms and eventually increase your reach. Twitter, Facebook, Google+ and Pinterest are the most suitable social media platforms for customer engagement. Create your brand and local business pages on given social media website and start engaging with your customers. Keep running paid campaign at given social media platform during festival season. You can promote your brand or products by targeting specific audiences based on their interest, age, location and many more factors. You can also push your reputation management campaign to improve your brand visibility across different platforms like Yelp, Local circle etc. According to Google’s shopping trends from 2015, over 80% shoppers watched product review on youtube to made a buying decision. This clearly shows the importance of having an youtube channel clearly explaining why customer should buy your products. Start creating videos or ask your existing buyers to share their experience buying your products and publish them on their youtube channel. If you are having marketing budget, hire influencers from influencer marketplaces like FameBit and create marketing campaign about your products. This will help you to reach large audiences through influencer who can produce and publish review at respective youtube channels. The next couple of months will be a busy time for all types of retailers, be it online or offline. Make sure you get the best out of the opportunity by considering tips and solutions discussed in this article. Do you have any query or need any help to promote your business on this holiday season; Contact Us now! We will get back to you within 24 hours!